VMware is hands-down the virtualization choice of large and small organizations. And it is easy to see why. Not only is it a highly reliable and scalable platform, but VMware provides a complete set of tools you need to deploy, manage, monitor, and protect virtual machines. And did I mention that it totally rocks the scalability challenge? Let’s look at how VMware customers who run Microsoft SQL Server applications can enable encryption and key management to protect sensitive data and meet compliance regulations. We have to solve the encryption key management challenge. As we like to say around here, the hardest part of security is encryption, and the hardest part of encryption is key management. We have to store the encryption keys separate from the protected data, and use industry standard practices to protect them. With our Alliance Key Manager for VMware solution we make this problem easy to solve. Our key manager comes in a ready-to-deploy OVA format and VMware customers can just launch the key manager with standard VMware tools. Of course, there are some security best practices on how to properly deploy a security application like a key manager in VMware (see the resources section below). With Alliance Key Manager’s Ready-To-Use options you can have your VMware key management problem solved in just SECONDS. Of course, some of our VMware customers want to protect encryption keys in traditional Hardware Security Modules (HSMs). No problem, Alliance Key Manager can be deployed as a rack-mounted HSM or as a vCloud instance. 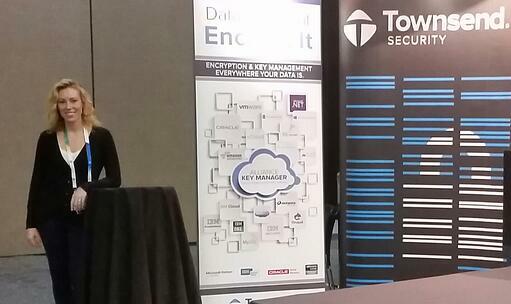 Now we want to enable encryption in SQL Server and protect the encryption keys with Alliance Key Manager. Thanks to Microsoft’s Extensible Key Management (EKM) interface, this is incredibly easy. Alliance Key Manager comes with EKM Provider software that plugs right into SQL Server to enable encryption and protect your encryption keys. We call this our Key Connection for SQL Server application and it installs on your SQL Server VMware instance using a standard MSI install process. Key Connection for SQL Server runs in all SQL Server environments including VMware, hardware, vCloud, and cloud platforms so hybrid environments are fully supported. Install the credentials, select the SQL Server instances you want to protect, answer some questions, type a few commands and you have a fully protected SQL Server database using Transparent Data Encryption (TDE). Again, this takes just minutes to accomplish. SQL Server also supports column level encryption, which Microsoft calls Cell Level Encryption. It can provide better performance for some SQL Server databases. Yes, that’s also supported through the same Key Connection for SQL Server software. The beauty of the Microsoft EKM architecture is that you don’t need to modify your SQL Server applications to deploy encryption. Your DBA and security team can get your data protected very quickly without a development project. Anybody got budget for that these days? 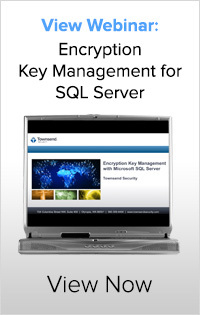 Already encrypting SQL Server but aren’t protecting your encryption key? That’s easy – you can install Key Connection for SQL Server, issue a few commands, and the problem is solved! What about high availability, business recovery, clustered configurations, and system logs? We’ve got all of that covered, too. Using the same Key Connection for SQL Server EKM Provider (did I mention that it’s free?) you can configure one or more secondary key servers that function as high availability failover servers for business recovery? Key Connection for SQL Server will automatically failover to secondary key servers if the primary key server is unavailable. Alliance Key Manager also fits nicely into your active monitoring strategy. You can easily enable forwarding of all key access, key management, encryption, and system activity logs to your log collection server or SIEM solution. Celebrate Victory and Do It Again! Alliance Key Manager protects Oracle, IBM, MySQL and other databases as well as web applications and unstructured data. You get to deploy one key management solution to protect everything. And do you know how much it will cost you to do your next project? Nothing, zilch, zed, nada! Alliance Key Manager does not force you to license and pay for client-side applications. I’ll talk more in future posts about how to protect other databases and applications in VMware environments. Stay tuned if you run SharePoint, Microsoft CRM or ERP applications, Oracle, or open source databases like MySQL and SQLite. How Much Better Can This Get? You can evaluate Alliance Key Manager and Key Connection for SQL Server in your own VMware environment free of charge. Just visit our Alliance Key Manager for SQL Server page and request a free 30-day evaluation. Encryption and key management? We can get this done right! MySQL is the most popular open source relational database system and is in wide use in commercial and non-commercial environments. It is natural that developers and security professionals want to know how to encrypt sensitive information stored in MySQL databases. While MySQL does not implement a Transparent Data Encryption (TDE) solution like Microsoft SQL Server and Oracle Database, you still have options to get the data protected with strong encryption and use a defensible encryption key management strategy. Alliance Key Manager provides shared libraries for Windows and Linux that provide the technical support for SQL Views and Triggers with User Defined Functions (UDFs). Using these shared libraries lets the developer fully automate the encryption tasks without changes to application code. Alliance Key Manager provides an example of how to do this in a Windows Server operating system context. Second, Alliance Key Manager provides many shared libraries and application code examples if you need to implement encryption in your applications. The extensive library of code examples include Java, PHP, Ruby, Python, Perl, C/C++, C#, VBNET and others. You can encrypt data in your applications, or send the data to the key server for on-device encryption. The on-device encryption option is a favorite of web developers who don’t want to expose encryption keys in their web server application. Alliance Key Manager is a NIST validated, FIPS 140-2 compliant solution that meets PCI DSS and other compliance regulations for protecting encryption keys. You can deploy the key server as an HSM in your own data center or in our hosting center, or as a VMware instance, or as a cloud application running in PCI DSS certified infrastructure. Alliance Key Manager is available with a number of licensing options that will meet the budget constraints of any organization. If you are a Windows developer and work with Microsoft SQL Server, you should get to know the SQL Server Worldwide User Group (SSWUG). The web site is sswug.org and has a wealth of information about everything you would want to know about SQL Server. And they are even branching out to other database systems like Oracle and IBM DB2. But the emphasis at SSWUG has been on SQL Server and you will find a large number of articles, blogs, videos and other content on wide variety of topics related to SQL Server. I’ve had the pleasure of working with Stephen Wynkoop on a number of occasions and really appreciate his depth of knowledge on security topics related to SQL Server. While not defining himself as a security specialist, Stephen brings a seasoned and mature approach to the subject of database security and I am always impressed with his thoughts and perspective. Recently SSWUG dedicated a section of their web site to “Townsend Security Tips” where they present videos of Stephen and I discussing security topics ranging from securing data with encryption and key management on SQL Server (not just with EKM) to protecting data in the cloud. Additionally, they post a new security segment just about every week on their homepage, so there is always something fresh. Upcoming sessions include meeting evolving compliance regulations and how to make sure your data is secure when you when trusting it to a hosting company. We have a great time recording these videos, and if you haven’t seen any yet, I urge you to check them out. In addition to the content on the SSWUG website, SSWUG also holds virtual conferences and Summer Camps that are great online resources for developers. SSWUG - Get to know them! If you are new at protecting data in Microsoft SQL Server environments, generally compliance regulations are what drive an encryption project. In the past, encryption has had a reputation for being difficult to do, complex, and time consuming, we hope to show you how that has changed. AES – Advanced Encryption Standard – this is the most common standards based encryption that is used to protect data whether that is in SQL Server or any other environment where data-at-rest is protected. Since it wasn’t thought of as something that improved the “Bottom line” by increasing revenue or decreasing expenses, encryption has historically been a project solely driven by the need to meet compliance regulations. AES encryption is a mathematical formula for protecting data. It is based on a proven, well-known algorithm and standards published by NIST. But since that formula is a open and vetted standard use, it is not the mathematical algorithm that is the big secret. It is what happens with the “Key” that locks and unlocks the data that all the fuss is about. Our solutions help Microsoft SQL Server customers really protect their data. Alliance Key Manager, our encryption key management hardware security module (HSM), is FIPS 140-2 certiied. This means it meets Federal standards that private enterprises expect around key management. We provide encryption key management solutions for every version and edition of SQL Server starting with SQL Server 2005.